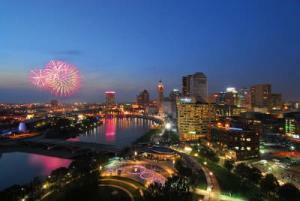 Red, White & Boom is the Midwest&apos;s largest display of Independence Day fireworks - and it definitely draws huge crowds to downtown Columbus. 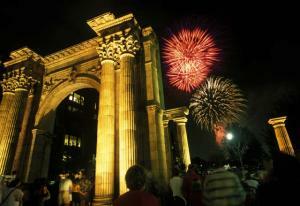 Full of exciting performances, great food and a fun parade, the event officially starts at 11 a.m. on Friday, July 1. This will be the first year that the grassy, 33-acre Scioto Mile riverfront park will be accessible during Red, White & Boom, and there are some amazing vantage points right along the river between North Bank Park and the Main Street Bridge. 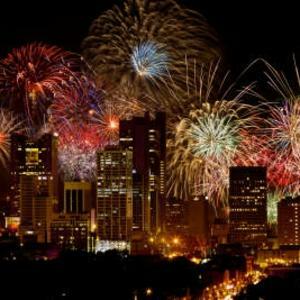 Some locations won&apos;t be accessible, specifically, Coleman&apos;s Pointe and the Broad Street Bridge, due to their close proximity to the fireworks launch site at Genoa Park. If you&apos;re planning to find a spot in a Columbus park, keep in mind that you aren&apos;t permitted to use stakes or posts. At 3rd St. at Broad St. - The Ohio Statehouse makes a patriotic backdrop as you watch the fireworks between the Leveque Tower and Huntington Building. Scioto Audubon Metro Park - though this is about 1.5 miles away, you&apos;ll have great views over the natural Whittier Peninsula. Goodale Park - A little north of the action, but it&apos;s not hard to find a clear view. Columbus Commons - Due east of the launch site with ample room to relax, a carousel, and the Bicentennial Stage, with entertainment running from noon - 11 p.m. The Arena District - The District puts on Taste of Boom between 3-11 p.m., where some of the city&apos;s best food vendors are set up along Nationwide Boulevard. Entetainment runs from 3-11 p.m. as well. From the Scioto River itself - boats are permitted in the river during Red, White and Boom (just not between the I-670 and Main Street Bridges.) If you&apos;ve got a canoe or kayak lying around - this would be a marvelous night. And the Most Comfort Don&apos;t feel like lugging your lawn chairs and picnic blankets? Want to have time to see more of the festivities without leaving someone behind to guard your spot? Check out COSI - they may have the best view in the city, and their Boom event includes access to the galleries, a picnic dinner, science shows and more for $90 for adults and $65 for kids. You can even beat the heat by visiting the museum exhibits, including GameMasters, or a showing of a movie about the science of fireworks or National Parks Adventure on the National Geographic Giant Screen Theater. Huntington Park is another great choice - for just $5 you get a guaranteed seat and plenty of entertainment (and access to all the great ballpark food!) There&apos;s not a bad seat in the house - the fireworks will be just beyond left field. The event starts at 5:30. Leave Your Car Behind COTA offers Park and Ride service from many suburbs, with guaranteed parking! Beat the Traffic - Completely! The best way to avoid late-night traffic out of downtown? Spend the night! There are some rooms still available around downtown - but book soon! That way, you have somewhere comfy to rest mid-day, and after the amazing fireworks, walk back and tuck in with no stress. Best of all, you can sleep in and then grab breakfast or brunch at a great restaurant or the North Market and see more of the city before you head home. If you choose to park at your hotel, keep in mind that there are (easily avoidable) street closures.